Most of the botting clients you probably know are Java based and work with Injection or Reflection. Examples are: Tribot, Topbot, Dreambot and the list goes on.Today I want to inform you guys about Color based clients. These type of botting clients are fairly unkown, but they seem to work very good for many people (including myself). I find the banrates significantly lower using the right scripters. 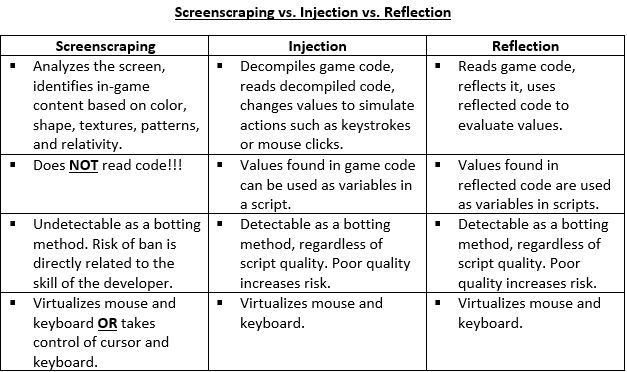 Lets start of with the difference between Injection, reflection and screenscraping (color based). As you can see in the image above color based clients (screen scraping) are the only clients that don’t read code! This makes it a lot harder for Jagex to detect you botting. The risk of ban is now directly related to the skill of the scripter. This means that it’s very important that you use an experienced scripter when it comes to color based scripts. The downside of using color based clients (that don’t read code) is that there are fewer possibilities when it comes to scripts. It’s much harder to make a script without using Java coding. Don’t get me wrong, there are still very complex color based scripts out there! Another downside with color based clients is that they aren’t as practical as Java based clients. Color based clients being harder to detect is a huge benefit and the main reason why I started experimenting with color based clients. I have botted over months (8 hours max/day, including breaks) without any bans using proper private color based scripts. I have definitely had some great successes with color based clients and I advise you all to give it a try. The color based client I mainly use is Simba. This entry was posted in Gold Farming Guides and tagged bots, botting, gold farm, gold farming, runescape, runescape bot by admin. Bookmark the permalink.